A direct replacement for an old time-lapse video recorder and multiplexer. Stores images on built-in 2Tbyte hard disk for instant retrieval and footage that will not degrade over time. Sophisticated motion-detection feature enables you to record only when activity is detected in front of your cameras, avoiding hours of blank wasted footage and therefore increasing storage capability. 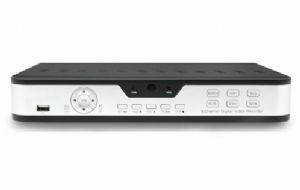 Accepts video and audio inputs from up to 4 cameras, hard-wired or wireless, and records all cameras in full-screen for optimum results in playback. Time and date stamps all footage, as required for use as evidence. Also has a LAN connection, allowing it to be connected to a network, or to a broadband router for remote monitoring over the internet.